Velvet Willow: Look who's here! We have been looking for a sweet, passive gelding... one that can keep Willow company (especially at night) during her long recovery. And also one I can ride and that will be good with the kids. This sweet boy is all that and more. 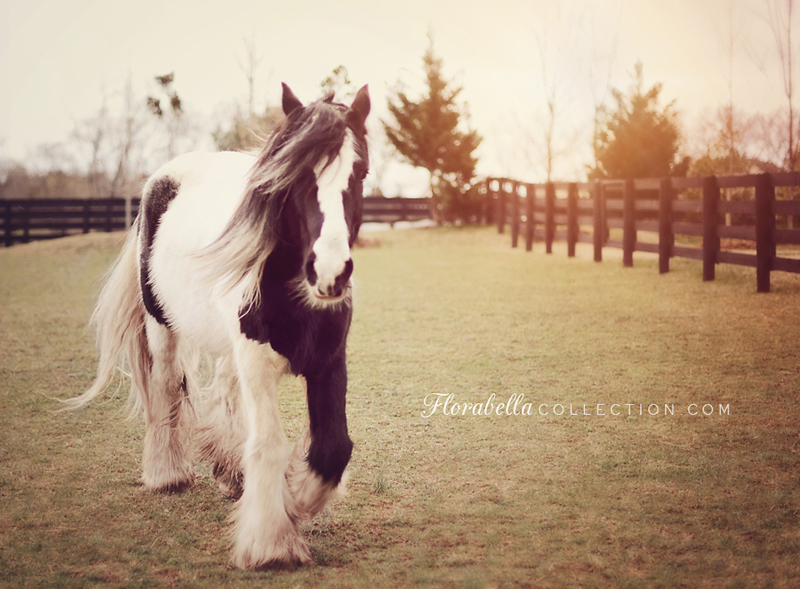 He's a 7 yr old Gypsy Vanner gelding. ♥ I consulted with everyone about him, and Martha even went out to ride him and thoroughly check him out after we did. He is such a sweetheart... just a big lover, like a teddy bear! Nothing phases him. Nancy was especially excited about him, because she breeds Gypsy Vanners. She said we couldn't have choses a better breed for our needs. Oh my, is he darling. I love his bell bottom feet and his sweet whiskers! He's a bit hard to photograph though... as he follows me around like a puppy dog! What a beauty! His feet remind me of a Clydesdale so the first name I thought of was "Clyde". I hope that him and Willow work out together! Looking forward to photos of Willow's return! Oh my goodness, I just love him! He is magnificent!! I showed his picture to my 9 year old son with autism and asked him what this horse should be named (and not really expecting an answer) he said "Kemp". I looked it up and it is a word with origins from England and the Gypsy Vanners were originally bred in the British Isles which include Ireland and the United Kingdom (England). Meanings for Kemp include a strong, brave warrior and an athlete. We think Willow needs her own strong, brave warrior to help her in her journey of healing so we suggest Kemp as a part of his name. Thanks for the updates on Willow. We have been praying hard for her and crying tears of sadness and joy with you. What a beautiful soul, I'm hoping he and Willow will bond, she is Queen after all, lol. Magnificent is the perfect word to describe him! He looks like a Parker to me! he's a real beauty, best of luck!!! Oh my goodness. He is so beautiful. He looks like a Charlie to me. He is BEAUTIFUL and looks like such a gentle snuggly soul. Shana, he is beautiful. I know nothing about horses ~ is he as big as he looks? He looks huge. You are so brave. He is beautiful. I like the name Birch. He's black and white like a birch tree and willow and birch just seem to go together. Oh my word, he's just gorgeous! I like the idea of his name tying into Willow's...Birch is nice and seems to suit, although I think Kemp sounds lovely as well. Thought this would make you smile: I woke up this morning hearing one of my girls running around with her iPad and squealing over gorgeous pics of Gypsy Vanners (yes she knows how to use Google images). I just scrolled up to look at his face and heard "Simon"... don't know what you're thinking of, so then I went to look it up because I thought maybe it was his present name. One of the meanings is "God has heard" ... and I think He surely has. Good luck to all. God bless. Didn't he have a name already? And wouldn't he know it? Looks like a "Spirit" to me, he's so gorgeous! Gandalf should be his name !